After a meeting where Gagarin was asked to talk about the Cosmonaut training center an idea crossed his mind to create a museum in the Star City. It occurred on June 24, 1961. "Let's create our own museum. It will be a kind of report on our work, and actually we need a museum just for ourselves, for history, for our junior followers"- he told to his audience. The first exhibit item of the museum was the figure of a molder presented to Gagarin in Czechoslovakia. The museum of Yu. 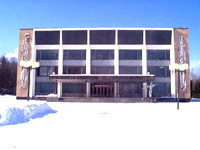 Gagarin Cosmonaut training center was officially opened on November 6, 1967. There are four exhibition rooms, devoted to the history of birth, development and development of manned space vehicles, success and tragic accidents in space exploration, the first person of the Earth who overcame the earth gravity. 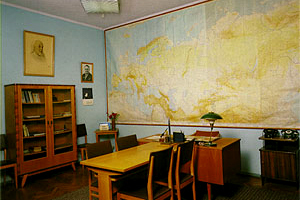 First room - "Origins of Soviet cosmonautics" tells about establishing of the Museum of Yu. Gagarin Cosmonaut training center, designers of rockets, satellites and manned space vehicles, fortunes and misfortunes of space pioneering. Second room - "Memorial room of Yuriy Gagarin" tells about his short but outstanding life: studying, work, wife and children, space mission training and tragic fate of Yu. A. Gagarin. Third room - "International space missions. Long-duration orbital stations" describes international flights under Intercosmos program and other international space programs. Fourth room - "Memorial working study of Yu. 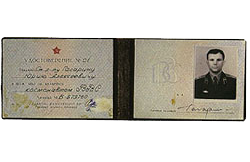 A. Gagarin", represents his working study in the way it was abandoned by Gagarin on March 27, 1968 before leaving for the airfield for training flight that became his last one. 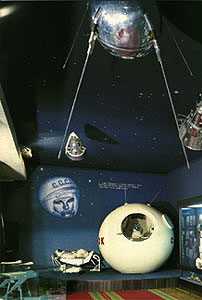 Traditionally Russian and foreign crews visit this study before their space missions. 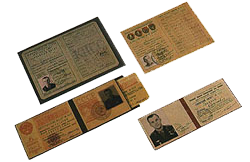 The study exhibits things and items that were used by Gagarin during his service in GCTC. 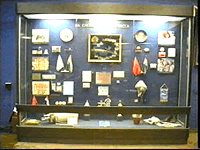 The study represents things and items that were used by Gagarin during his service in GCTC. a vase with flowers painted on it. Altogether - 50 museum pieces.